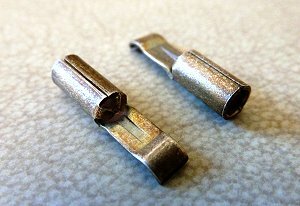 Connectors - for Battery Packs and Electric Motors • For RC Models. • RCScrapyard. 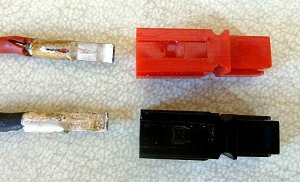 RCScrapyard ► Battery Pack / Motor Connectors - for RC Models. For Rechargeable Batteries and Electric Motors. 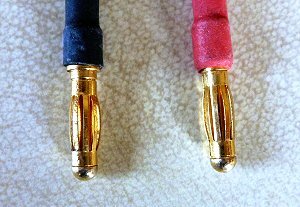 Which Connectors are the best? Then I remember buying some second hand batteries at an area meeting one day, that had these little red block connectors. I soon learned they were "Deans" rated at around 40 Amps. They looked like just what I was looking for so I gave them a try. They worked fine, although I didn't like the shortness of the part to be soldered. 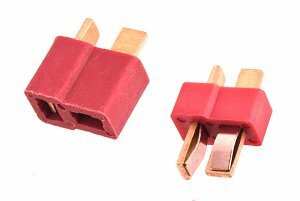 However, for about two years they were my connector of choice, until I stumbled across an advert in the "Radio Race Car International" magazine.